This diptych from the Lyon Collection is extremely instructive for those who are fascinated by ukiyo-e prints because it is so similar to a diptych by the same artist and same publisher found in the Museum of Fine Arts in Boston. But they are not the same. The left panel is almost identical, but with slight differences: the actor and his identifying cartouche have been recarved. The right panel is almost entirely different. There is no man holding a scroll standing on the shore and the fellow splashing about in the waves at the tail end of the fish has been replaced by a man with a sword raised about to strike the fellow on the left. The diptych in the Lyon Collection is clearly the earlier version, dated 6/1855 while the one in Boston is dated 7/1856. There is an album of prints in the collection of the National Diet Library in which there is a copy of this diptych. However, these are crepe prints. There is another copy of this diptych in the collection of Ritsumeikan University. The popular theatrical retelling also involves the theft of a precious scroll painting of a carp (koi). 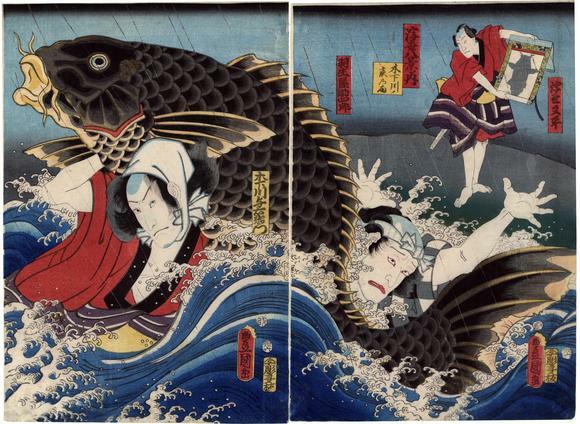 When Rokusaburō tracks down the thieves and wrestles the scroll away from them, the carp comes to life and escapes. Shigeharu's print shows him trying to capture the carp, a scene called koi no tsukamimono ("catching hold of the carp"). The play was performed in the summer, and real water was used on the stage (called mizuiri or "in the water").